Nancy has been knitting most of her life, a skill she learned as a young girl. The knitting lead naturally to interest in fibers and how they are colored and spun into yarns. Not long after college, she purchased a spinning wheel, and began the process of teaching herself how to spin. 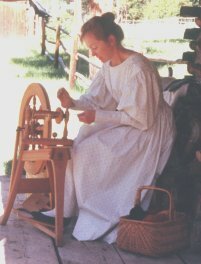 Now, many years and miles of yarn later, her spinning skills have become very good, and she has given demonstrations for a variety of schools and groups, and regular historical demonstrations near her home in the Rocky Mountains of Colorado. In addition to spinning and then knitting an endless stream of gifts for relatives, her spun and knit efforts also show up on some of her figurines. She has taught spinning, and is still available for demonstrations, classes or lessons. To compliment her spinning, she took on the task of understanding natural dyes. After moving to the Rocky Mountains from Wisconsin, with the many mountain plants right out the door, she began collecting materials and experimenting with colors. She uses her quilting as a way to showcase some of the subtle color shades that can be achieved using local mountain plants.